I have seen first hand how the streets eat childhoods. spitting out any bones of humanity. and I cannot stop thinking why does this happen. why do we let this happen. Where is the ladder for your dreams to climb? that your dreams will be able to climb. It began with an Empire State Partnership (ESP), funded by The New York State Council on The Arts, between The New York State Literary Center and Rochester City School District’s Youth and Justice Programs in collaboration with the Office of The Sheriff, County of Monroe. It began with funding from the Palma Foundation for the establishment of a library, writing, and publishing center to reward students / inmates who have demonstrated participation, follow-through, and commitment. 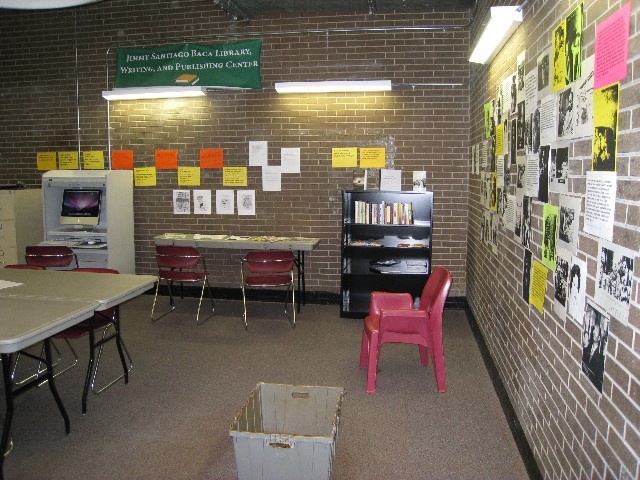 It began with students / inmates participating in NYSLC’s ESP who continually asked for a writing center in the jail. It began with the words of Jimmy Santiago Baca in his memoir, A Place To Stand. It began with the Sheriff’s Department finding a room on the fifth floor of the Monroe County Jail. The room was being used as a storage room for everything and anything, boxes, storage cabinets, filing cabinets. It began by working with Sheriff’s Deputies and trustees to clear the room and clean it. It began by finding tables, chairs, computer cabinets, book cases that were not being used and moving them in. It began with an installation on the wall, a marriage of hip- hop, African American history, and the work of contemporary writers and artists. It began with placing the artwork and writing of students / inmates on the walls. It began with the belief that learning is exciting and that a library of books relevant to the students’ / inmates’ identities, histories, and inspiration by inmates who have turned their lives around through writing is important. It began with the belief that a space where students / inmates can come and read and write and be human, a place where the dreams in their hearts can grow and be nourished as they learn technology skills will increase literacy. I feel my life is a war, living in a place that is really crazy. People die every day in Rochester, and all I can do is hope that it’s not someone from my family or a close friend. Coming to jail has made me want to change my life around. I am happy to be where I am and not dead or hurt. I am learning new things. When I was going to school, I was mad at the officers for making me go to school everyday or locking me in. Then one day I came to school and a woman by the name of Dale Davis was there. She was talking about a lot of things, and I was like “She really doesn’t know what she’s talking about.” She was a white woman talking about rappers that I thought she didn’t have a clue about. The I went to The Jimmy Santiago Baca Library, Writing, and Publishing Center. For the first time it felt like I wasn’t in jail the whole time I was there, but I was in jail. I learned there are really people who care about us young men. I didn’t think people cared that much. It’s not like our schools outside of jail. In The Jimmy Santiago Baca Library, Writing, and Publishing Center I see what I am really able to do and there is help there when I need it. It is easy to learn things there that I never in my lifetime thought I could do. The Jimmy Santiago Baca Library, Writing, and Publishing Center makes me feel comfortable because it fills me with joy and happiness. For example, if I am sad and ready to fight, I go to the fifth floor, and I feel like a different person inside. I feel like I’m no longer in jail. This is why I appreciate what Dale Davis has done for us because we are in jail. The Jimmy Santiago Baca Library, Writing, and Publishing Center keeps me going while I am in here with knowledge and support and lets me know my life is not over. In the Jimmy Santiago Baca Library, Writing, and Publishing Center, Dale Davis taught me to never give up on myself. In the short time I have been in this program, I have learned to express myself and share my feelings and my still developing thoughts through writing. I have learned to release the feelings, aspirations, and dreams I have. Please read this with your minds and hearts to understand. searching, yearning, and longing for love. The Jimmy Santiago Baca Library, Writing, and Publishing Center is a good idea because incarcerated young men like myself get to go up there to express what we feel is going on in the world and how we feel about being in jail. It’s kind of like a get-away where I can express my feelings and not be ignored or taken for a joke. Being in that room is like being a deaf person learning to talk. What I mean is usually I am not heard but in that room I am heard, understood, and my opinion does matter. With Dale Davis’ help my point gets out where usually I am trapped like a bird in a cage waiting to be released. What I am trying to say is the library is a good way for young men to learn to express themselves and their views on life and our world. There should be more programs like this to help young men be heard.